I recently wrote an article for Southern Culture on the Fly magazine that talked about streamer fishing tactics and rigging for small trout water, and I wanted to share it on the blog. Make sure to check out the full fall issue of SCOF, which is gangbusters as usual. Below is my revised version that I’ve edited to be a little more clear, and I’ve added further explanation in areas that I felt needed it. Streamer fishing isn’t for everyone. I’ve known fly fisherman that would refuse to tie one on, even if you offered them a 20 dollar bill. But for those very few anglers that find fishing them repulsive, there’s plenty more of us out there that hold a deep love for streamers. It’s long been known by fly fisherman that streamers hold an uncanny ability to tempt the largest fish in our water. Streamers work on all types of trout water (rivers, streams and still-waters), but despite their wide range of effectiveness, most of the attention and information provided to fly fisherman in the past has been heavily skewed toward only promoting fishing them on our larger rivers and streams. To some degree, this favoritism has resulted in giving the impression to many beginner and intermediate fly fisherman that streamer fishing isn’t meant for small stream applications, and they should leave them at home. The truth is, that’s not the case at all. I’ve landed some of my largest trout on small streams with streamers when I couldn’t get them to eat a dry or wet fly. It’s important for fly anglers to know they can have just as much success with streamers on small water as they can on larger water, and they shouldn’t overlook the opportunity to use them when conditions are right. Furthermore, if we lumped all of our trout water together in the region, the overwhelming majority of it would be considered small trout streams, creeks and high-elevation tributaries. The first thing you need to understand is that you need to fish streamers differently than you do on large trout water. Large water streamer fishing is all about making repetitive presentations and covering lots of high percentage trout water–you make considerably longer casts and stealth becomes less of a factor. On small trout water, stealth is huge and you don’t want to cover a high percentage of trout lies by carpet bombing it with a plethora of presentations. You’ll find it much more effective if you instead take a hunter’s approach that focuses on making a one-shot kill. Start out by first locating where you think a large trout may be holding, approach the spot with a high degree of stealth, and lastly, strive to make a presentation that allows you to work your streamer through the highest percentage spots right off the bat. You want to accomplish this with as few casts as possible, preferably only one or two. There’s no dissecting water with your streamers here, folks. We’re not trying to see how many fish we can catch out of each hole. Nor are we trying to cover every square-inch of water. The excitement that triggers a trout into chasing down or eating your streamer lasts only for a brief period. That’s why it’s so important that you take the time to pick and choose your first couple casts strategically. So always cast to the prime water first and the subpar or secondary water second. If you target the water in the opposite order, most of the time your fly will swim through the water out of the target fish’s feeding range, and you’ll greatly decrease your chances of surprising and triggering a reaction strike (your best case scenario for a hookup). You’ll also risk alerting and spooking the fish before you have a good shot at getting your fly in front of them. 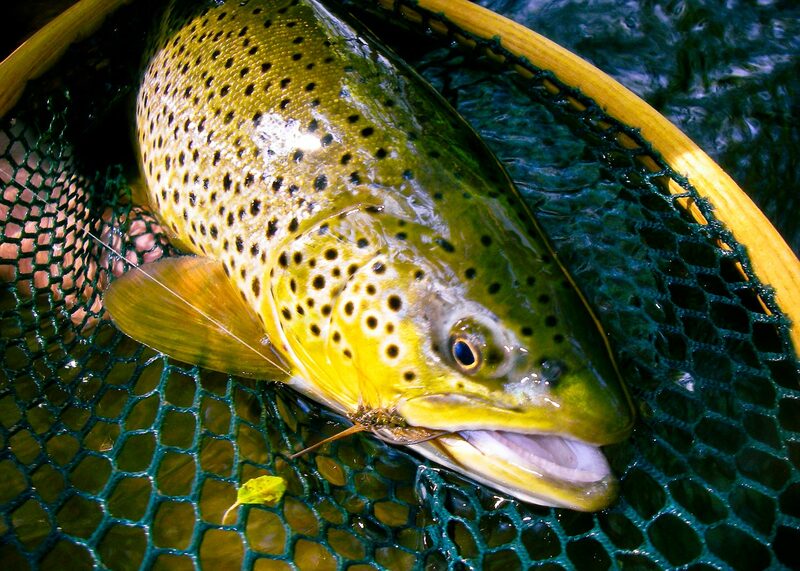 To be successful at streamer fishing, it’s critical that you choose the correct fly fishing gear for the type of water and location you’ll be fishing. Your fly rod, fly line and leader need to be handpicked so that they all work together. That being said, you can’t effectively streamer fish small streams with most of your big water gear. You don’t need a full sinking line or an eight or nine weight fly rod, and you don’t need to chuck giant streamers to catch trout either. If chosen incorrectly, it will keep you from fishing at your full potential, and you’ll find much less success. Start out by choosing an eight to nigh-foot medium-fast action fly rod. I’m not talking about a stiff broomstick. We do want the rod to have some limberness so it can perform well at short casting distances, roll cast fairly well and allow us the ability to present the streamer reasonably quiet during a cast if needed. One of my favorite small stream streamer rods is a Thomas & Thomas Helix 9-foot 6wt. You’ll next want to choose a weight-forward floating fly line with an aggressive front taper that excels at turning over large and heavy flies (like a Rio Power Fly, SA Floating Streamer Express or Orvis Hydros Power Taper). So far, that’s relatively common sense for most, but I take it a step further by attaching an Airflo Poly 5-foot Leader (clear-floating or intermediate version) to the end of my fly line. It’s very similar to a smaller diameter version of your fly line that’s clear and turns over streamers effortlessly. By using a Poly Leader, you’ll find your loops won’t hinge and seldom will collapse from a heavy streamer at the end of your cast. I generally go with the clear intermediate version because its slow sink rate helps me to keep my fly a little deeper during the retrieve. However, I will use the floating version when I’m dealing with really low water conditions. How many times have you had a trout follow your streamer to the boat and have it turn off at the last second because it spotted you? It’s happened to me plenty of times. On smaller streams we are constantly fighting to stay under the radar of fish. The smaller streams and shorter presentations put us close to the fish, and our bright fly line even closer. Plain and simple, the Airflo clear floating and intermediate Poly Leaders provide me with a little bit of extra stealth during my presentations when fishing streamers on small trout water. The last component in my small trout water streamer rig is my tippet. I generally attach a short three to six foot section of fluorocarbon tippet (4x-2x) to the end of my poly leader and tie on my streamer with a non-slip loop knot. I’ve been using this setup for the last few years with great success. It casts way more graceful than your standard WF fly line and tapered leader setup, improves accuracy, helps keep my streamer in the correct depth and improves my overall stealth. Don’t make the mistake of thinking the larger or heavier the fly, the harder you need to cast your fly rod. Focus on timing and smooth acceleration throughout the casting stroke. Match the speed of your retrieve and/or strip to the speed of the water current you’re fishing (fast water = slow strip, slow water = fast strip). Choose either a downstream-and-accross or upstream-and-across presentation depending on what’s best for the situation. Many anglers prefer to wade and fish streamers down stream, and that’s fine, but keep in mind, by doing this on small streams, you’ll greatly increase the risk of spooking fish. Don’t rule it out completely because there will be times when it’s the only way to get your fly to the target water. Take the time to think your approach out so you’re fishing smart. Carry streamers in various weights and sizes to match the current water conditions, and make sure they represent local bait-fish/juvenile trout, sculpins and crayfish. Don’t stick with fishing only one streamer during the day. Experiment with the color and size of your streamers if you’re not getting the trout’s interest. Sometimes all you have to do is down size or go from a dark pattern to a light pattern. In tight quarters or super short presentations where you can’t get a lot of fly line out, try tying on a heavier streamer and jigging the fly up and down in the water column to keep the streamer in the strike zone and productive water longer. This method works great for pocket water and undercut banks. For high water, consider fishing an intermediate or sink-tip fly line, or use a sinking airflow poly leader. Use dark streamers in low light or for off-colored water conditions. They will provide a much better silhouette for the trout. Use realistic, brighter or flashy streamers when it’s clear water or sunny conditions. This entry was posted in Streamer Fishing and tagged Gink & Gasoline, Gink and Gasoline, Kent Klewein, Louis Cahill, SCOF, streamer fishing, streamer fishing tactics, streamer fly fishing, streamer fly fishing rigs, streamer fly line, streamer leaders, Streamer Tactics for Small Trout Water by Kent Klewein. Bookmark the permalink. Thanks Kent, got me thinking. I mostly fish around Ellijay and Blue Ridge and the only fly close to a streamer in my box are the usual buggers. Any recommendations for streamers I should add for North Georgia? Hey man, one of my favorite small stream streamer patterns is the Sculpzilla in olive or white in the smaller size. I’ve caught fish on that pattern all across the United States on smaller trout water. I use the larger size in the bigger water. As far as specific streamer patterns, you don’t always have to get too specific. One tip I mentioned in the post is to find types of larger forage food is available on the small streams you fish, like native chubs or daces, juvenile trout or crayfish. Try to mimic the size and colors of those. Then again, flashy streamers can out fish all of those some days. If you tie flies, get creative and have fun. You don’t have to be an advanced tier either. It can be as simple as tying an above average sized rubber legged woolly bugger with flash. I like tying mine with a two-tone color look. Most important with success is your gear, approach and presentation. Thanks for your comment. Though this is completely against the idea of getting too specific, my interest in tying the Sculpzilla has taken the wheel here… Do you tie your own or buy them? If you tie them, do you use the specialized conehead with eyes? I don’t mind picking them up if necessary, but wasn’t sure if they have been necessary or not. At least they’re cool looking. I do both depending on where I am when I run out of them. I like the special coneheads with built in eyes but it isn’t mandatory. Visit the link below for a video on tying the Sculpzilla. I like the idea of the Airflo leaders. I’ve not heard of them before and clicked your link. I see there’s a 10′ and 5′, which one do you use, 5′ I assume? And I was thinking because those leaders are fairly pricey, I was thinking of tying a loop in the end of the leader and attaching the tippet via loop to loop connection. Would you see any problem with that? I use the 5 foot Airflo Poly Leader. And yes, the loop to loop connection is exactly how it is designed to rig up. I suppose if I read more into the description of the leader on the link I would have read that Airflo puts a perfection loop at the end of those leaders, ha! You mention using a poly leader. How long should this leader be, or does it come in a single length? I use the 5 foot Airflo Poly Leader for my small trout water streamer fishing. This is something I’ve always given some thought, but I’ve never thrown streamers on small water. I’ve always done the stereotypical thing and only fished streamers on big water. Something I’ll have to work on, and I can think of a few places to try this out. Thanks for bringing this up Kent. Thanks for the feed back Kent. Great article. I love streamer fishing on small streams. My rods of choice this fall have been a Diamondback VSR (9ft 4wt) and a Hardy Zenith (9ft 5wt). On both rods I use a Cortland Line – either the Clear Creek or the Trout Boss. Both excel at turning over the flies I am casting. I agree that targeting specific water is a good idea, but you have to remember that the water being focused on can vary according to time of year, water temperatures, etc. Right now in my region, the fish are primarily holding in faster, shallow water. Flats and holes may have some fish, but certainly not many, and definitely not the hogs we all want to catch. In a month or so (or when the water temps drop below 40) the lies will primarily be in deeper holes. I tend not to change flies much. I will generally start with an Olive Wooly Bugger (Size 8 or 10) and stick with it most of the day. There are times, that I might vary and try something else (small clouser, clouser foxy, black ghost, gartside soft-hackle) but more often than not, I will just add a second streamer one size down from the lead streamer and either darker or lighter in color depending on conditions and color of the front streamer. Again, thanks for the great article. Tight Lines. i built my first ever rod last winter when T&T sponsored a class for our TU chapter. i build a 8’6 3 wt expressly to fish high mtn. streams. on my first outing i was faced with the issues mentioned in your article. luckily i chose a hornburg thinking i could fish it dry and down through the pool then retrieve it in short strips subsurface. i was rewarded with a 13″ brookie on my 3rd cast – priceless. Thats straight up rockin man. I want to attend that T&T class at some point. Great guys and great rods. I recently fished some small stream mountain brookies in western virginia and was surprised by all the crayfish I saw. I was surprised and happy. Where there are larger food sources, there are larger fish and we definitely saw some beauties. I just couldn’t believe all the crayfish in such a small stream. My fly box was not prepared. Thanks for these great tips! I’ve got to tie some crayfish and drive back to the mountains. I enjoyed the post! Just curious what you guys would categorize as small trout water? Here in the Driftless, most of our streams are smaller spring creeks, with the “tiny” streams being about the width of a sidewalk give or take a few feet in either direction. I regularly blog about throwing streamers in tight quarters on tiny water. I’ve found it necessary to develop a different set of tactics for the tiny stuff. Just put the finishing touches on an upcoming American Angler article on the subject. Glad to see others sharing tactics as well! Great to hear from you man. The small trout water I was referring to in the article would be for streams and creeks that are 10-25 feet wide. Maybe a little smaller or larger where the stream widens up or narrows. I definitely wasn’t talking about streamer tactics for streams as wide as a side walk that you referred to. I look forward to reading your article. When will it be coming out, so we can all check it out? A 25 foot stream in these parts would be average to bigger water (not including Great Lakes tribs). Obviously that isn’t the case for other parts of the county, out west in particular. That’s the full width of the creek. Streams and tribs down to a foot or two wide can still produce big fish, and are overlooked by many. A lot of what you wrote is completely relevant for the tiny ones also! Jan/Feb 2013 American Angler. Awesome fish and picture man. The small trout water I fish runs anywhere from 10 feet to 25 feet at it’s widest. But most of the time it is much narrow than 25 feet. Just trying to give you an appropriate range. I’m really excited to read your article man. You didn’t mention when it will be coming out though. I have put tippet rings on the tippet end of all my polyleaders (Airflow and Rio), in fact on all my leaders. You don’t use up leader when you need to add tippet, so your leader costs drop dramatically. Awesome tip man. Thank you for sharing with everyone. I have some questions about poly leaders. I am wondering if it is a good idea to do a loop to loop connection on the tippet end of the poly leader? or are you just referring to the connection from fly line to poly leader? Also, could this same set up (poly leaders) be adapted to function well on bigger and deeper rivers? if so, how would you adapt it? split shot? or different sink rates of poly leaders? or would it be better to use sink tips at this point?